The foreign policy of the Bill Clinton administration was the foreign policy of the United States from 1993 to 2001 while Bill Clinton was president. Clinton's main foreign policy advisors were Secretaries of State Warren M. Christopher and Madeleine Albright and National Security Advisors Anthony Lake and Sandy Berger. Clinton assumed office shortly after the fall of the Soviet Union and end of the Cold War, which had left the United States as the world's only remaining superpower. As such and soon after taking office, President Clinton had to decide whether and how the United States would deal with the violence of numerous conflicts internationally. These would include the deployment of military force in several regions primarily for the purposes of protecting civilians, or armed humanitarian intervention, as the result of civil war, state collapse, or oppressive governments, which would occur in Somalia and Rwanda, in Bosnia, Herzegovina, and Kosovo in the former Yugoslavia, and in Haiti. Clinton also worked his foreign policy on long-running conflicts in Northern Ireland, and the Middle East, particularly the Israeli–Palestinian conflict. The end of superpower rivalry had freed the UN and other regional security institutions from their previous Cold War mind-set, and created new opportunities for them to play a more active, collective role. Despite international norms of state sovereignty and non-intervention, the idea that the international community should intervene in a country for the good of its own people gained greater legitimacy. International organizations such as the UN and regional security such as NATO, the OAS, and the OAU would play a role in bestowing legitimacy on the operations and in organizing a collective response. Domestically however, these new developments at the international level became enmeshed with a long-standing struggle between Congress and the president over war powers, and differences in treaties between domestic and international understandings of the term. Which branch of government was to control the deployment of American troops occupied these debates almost as much as the merits of the individual interventions. These debates were not new, with the struggle over war powers being a constant feature of American foreign policy, especially since WWII when it first gained superpower status, joined international organizations, and signed its first mutual defense treaty in more that 150 years. Clinton would utilize both the multi-national cast and the explicit blessing of international organizations for support in most of these involvements. These largely humanitarian operations during his term met much more congressional opposition, and enjoyed less frequent congressional authorization, than did operations during the Cold War. This involvement suggests that the president had found international organizations to be a useful ally in part to decrease and to overcome the resistance of the national legislature. Clinton embraces British Prime Minister Tony Blair. Just weeks before Clinton took office, President George H. W. Bush had deployed American soldiers to Somalia, a coastal nation on the Horn of Africa, where people were suffering and dying from starvation and civil war. The soldiers were sent to guard food and other relief supplies from being stolen by warring factions. After soldiers faced fire from armed clans and 19 soldiers were killed in 1993 in the Battle of Mogadishu, the mission quickly lost popularity with the American people. Fearing chaos resulting in the starvation of Somalia's civilians and to help U.S. Forces defend themselves, Clinton increased troop presence in the country. Demands for withdrawal, however, grew louder and Clinton ordered troops out of the country in March 1994. This left Somalia in a state of chaos, with warlords battling for control. In April 1994, genocide in Rwanda erupted due to a conflict between Hutu and Tutsi ethnic groups. Over the next few months, an estimated 500,000 to 1 million Rwandans, mainly Tutsi, were killed. By July, the Rwandan Patriotic Front took over the country. Although the Clinton Administration and the international community was aware of the genocide taking place in Rwanda, no action was undertaken. By the end of July, nearly two million of Hutus fled the country for safety, spawning the growth of refugee camps in neighboring countries. As thousands of people died of disease and starvation in these refugee camps, Clinton ordered airdrops of food and supplies for the Hutu refugees, including known genocidaires. In July, he sent 200 non-combatant troops to the Rwanda capital of Kigali to manage the airport and distribute relief supplies. These troops were subsequently withdrawn by October 1994. Clinton and the United Nations faced criticism for their non-response to the genocide. When Clinton traveled to Africa in 1998, he said that the international community, presumably including the US, must accept responsibility for the failure to respond to the massacres. When speaking about the Rwanda Crisis, Clinton called it his worst failure, admitting "I blew it." During his African trip, Clinton also referred to the concept of the "new generation of African leaders". In August 1998, terrorists bombed the United States embassies in the capitals of two East African countries, Nairobi, Kenya, and Dar es Salaam, Tanzania. About 250 people were killed, including 12 Americans, and more than 5,500 were injured. After intelligence linked the bombings to Osama bin Laden, a wealthy Saudi Arabian living in Afghanistan who was suspected of terrorist activity, Clinton ordered missile attacks on sites in Afghanistan and Sudan in retaliation for the bombings at the U.S. embassies and to deter future terrorist attacks. The Clinton administration maintained that the sites—a pharmaceutical factory at Khartoum (the capital of Sudan) and several alleged terrorist camps in Afghanistan—were involved in terrorist activities. Clinton with Jacques Chirac outside Élysée Palace. Bill Clinton Boulevard in Pristina in 2003. Much of the focus of Clinton's foreign policy during his first term was the war in Bosnia and Herzegovina, a nation in southeastern Europe that had declared its independence from Yugoslavia in 1992. This declaration was the catalyst of a war between Bosnian Serbs, who wanted Bosnia to remain in the Yugoslav federation, and Bosnian Muslims and Croats. The Bosnian Serbs, who were supported by Serbia, were better equipped than the Muslims and the Croats; as a result, they populated and controlled much of the countryside in ways including besieging cities, such as the capital of Sarajevo. This caused widespread suffering, and in response Clinton proposed bombing Serb supply lines and lifting an embargo preventing the shipment of military arms to the former Yugoslavia (a policy known as lift and strike). European nations, however, were opposed to these moves. In 1994, Clinton opposed an effort by the Republicans in Congress to lift the arms embargo, as it were, because American allies in Western Europe were still resistant to that policy. Clinton continued to pressure western European countries throughout 1994 to take strong measures against the Serbs. But in November, as the Serbs seemed on the verge of defeating the Muslims and Croats in several strongholds, Clinton changed course and called for conciliation with the Serbs. After the 2nd Markale massacre, in which Bosnian Serb forces reportedly shelled a crowded market-place in Sarajevo, NATO, led by the United States launched Operation Deliberate Force with a series of airstrikes against Bosnian Serb targets. The air campaign, along with a counter-offensive by better-equipped Muslim and Croatian forces, succeeded in pressuring the Bosnian Serbs into participating in negotiations. In November 1995, Clinton hosted peace talks between the warring parties in Dayton, Ohio. The parties reached a peace agreement known as the Dayton Agreement, leaving Bosnia as a single state made up of two separate entities with a central government. In the spring of 1998, ethnic tension in the Federal Republic of Yugoslavia–the state formed from the former Yugoslav republics of Serbia and Montenegro–heightened when the military forces responded in the Autonomous Province of Kosovo and Metohija. More than 90 percent of the residents of Kosovo were Muslim and ethnic Albanians, many of whom wanted independence from the country. Yugoslav forces were mobilized into province to quell Albanian rebels. Through attempting to impose the Rambouillet Agreement, Clinton, who strongly supported the Albanians, threatened the Yugoslav administration with military strikes. On 24 March 1999, NATO, led by the United States, launched the two-month bombardment of Yugoslavia. The strikes were not limited to military installations and NATO targets included civilian targets such as factories, oil refineries, television stations and various infrastructure. The intervention, which devastated Yugoslavia, was not approved by the United Nations, the UN General Assembly or the UN Security Council, and was strongly opposed by both Russia and China. It was the first time in NATO's history that its forces had attacked a sovereign country, and the first time in which air power alone won a battle. In June 1999, NATO and Yugoslav military leaders approved an international peace plan for Kosovo, and attacks were suspended after Yugoslav forces withdrew from Kosovo. In 1994, Clinton publicly demanded that the Haitian government step aside and restore democratic rule, despite the fact that before the coup, Washington had repeatedly been undermining it. Congress was united in opposition to American intervention. With United Nations backing however, Clinton deployed a large U.S. military force to the country in September 1994. Just before U.S. troops reached Haiti, Clinton sent a delegation led by former President Jimmy Carter to urge Cédras to step down and leave the country. Cédras agreed and surrendered the government to Aristide. Cédras and his top lieutenants left the country in October, and just days later, U.S. troops escorted Aristide into the capital as part of Operation Uphold Democracy. The democratic government of Aristride was restored, but only on the condition that it adopt the economic programme of the defeated U.S.-backed candidate in the 1990 elections. For further information on the overarching strategy of President Clinton's approach to the Middle East, particularly Iraq and Iran, see dual containment. Yitzhak Rabin and Yasser Arafat shake hands at the signing of the Oslo Accords on September 13, 1993. Clinton was likewise deeply involved in the Middle East peace process to negotiate peace agreements between Israel and the Palestinians, as well as with the governments of Egypt, Jordan, Syria and Lebanon. Secret negotiations mediated by Clinton between Israeli Prime Minister Yitzhak Rabin and Palestine Liberation Organization (PLO) Chairman Yasser Arafat led to a historic declaration of peace in September 1993, called the Oslo Accords. Clinton personally arranged for the peace accord to be signed at the White House on September 13, 1993. The agreement allowed a limited Palestinian self-rule in the Israeli-occupied West Bank and Gaza Strip. In July 1994 Clinton helped coordinate a historic compromise between longtime enemies Israel and Jordan to end their state of war. With this agreement between Jordan's King Hussein and Israel's Rabin, Jordan became only the second Arab state (after Egypt) to normalize relations with Israel. The 1993 and 1995 peace agreements between Israel and Palestine, however, did not end the conflict in the Middle East. As the peace process came to a stall, Clinton invited Israeli Prime Minister Benjamin Netanyahu and Palestinian leader Yasser Arafat to peace talks on the Wye River in October 1998. The two leaders signed yet another agreement, known as the Wye River Memorandum, which called for Israel to transfer more territory in the West Bank to the Palestinians. In return, the Palestinians agreed to take steps to curb terrorism. They also agreed to a timetable to negotiate a final resolution of the Palestinian fight for an independent state. After an abrupt outbreak of violence sparked by the agreement, however, Netanyahu refused to cede any more West Bank territory and placed new demands upon Palestine. His ceding of territory had shaken his own coalition, though, and together with other factors, this contributed to the downfall of the Netanyahu government in Israel. As a result, in May 1999 Israelis elected Ehud Barak, the leader of a political coalition that favored resuming the peace process, to replace Netanyahu as prime minister. Clinton continued to work passionately on negotiations between Israel and the Palestinians. Throughout his last year in office, Clinton came close to arranging a final peace settlement but failed, according to Clinton, as a result of Arafat's reluctance. Clinton related a phone conversation he had with Arafat three days before he left office. "You are a great man," Arafat said. Clinton replied, "The hell I am. I'm a colossal failure, and you made me one." Clinton was also confronted with problems in Iraq. In 1991, two years before Clinton became president, the United States under President George H. W. Bush participated in the Persian Gulf War to liberate Kuwait from the Iraqi occupation. In 1991, the warring parties signed a cease-fire agreement and the United Nations Security Council passed United Nations Security Council Resolution 687 requiring Iraq to eliminate its weapons of mass destruction and allow inspectors from the United Nations Special Commission (UNS-COM) to monitor the country's adherence to the agreement. In addition to UN inspections, to ensure the Iraqi compliance of Resolution 688 which called for Iraq to end its oppression of Iraqi citizens, the no-fly zones over Iraq were established by the U.S. and its allies to protect the Kurds in Iraqi Kurdistan and the Shiites in southern Iraq from aerial attacks by the Iraqi government. On June 26, 1993, Clinton ordered a cruise missile attack on the Iraqi Intelligence Service's (IIS) principal command and control complex in Baghdad, publicly announced as retaliation for the assassination attempt by the IIS on former President George H. W. Bush while he was visiting Kuwait in April of that year to commemorate a coalition victory over Iraq in the Gulf War. Fourteen cruise missiles were launched from USS Peterson and nine of them launched from USS Chancellorsville. Sixteen hit the target, while three struck a residential area, killing nine civilians and wounding 12 others. Four missiles were unaccounted for. This strike was in violation of international law, although that point is contentious. In September 1996, Clinton ordered Operation Desert Strike, and ships from the USS Carl Vinson Battle Group, including USS Laboon, and USS Shiloh, in conjunction with B-52 bombers escorted by F-14D Tomcats from USS Carl Vinson, launched 27 cruise missiles against Iraqi air defense targets in southern Iraq. A second wave of 17 was launched later that day. The missiles hit targets in and around Kut, Iskandariyah, Nasiriyah, and Tallil. This was done in response to Saddam Hussein, an Iraqi dictator, attempting to launch an Iraqi military offensive campaign in the Kurdish town of Arbil in Iraqi Kurdistan. Together we must also confront the new hazards of chemical and biological weapons, and the outlaw states, terrorists and organized criminals seeking to acquire them. Saddam Hussein has spent the better part of this decade, and much of his nation's wealth, not on providing for the Iraqi people, but on developing nuclear, chemical and biological weapons and the missiles to deliver them. The United Nations weapons inspectors have done a truly remarkable job, finding and destroying more of Iraq's arsenal than was destroyed during the entire gulf war. Now, Saddam Hussein wants to stop them from completing their mission. I know I speak for everyone in this chamber, Republicans and Democrats, when I say to Saddam Hussein, "You cannot defy the will of the world", and when I say to him, "You have used weapons of mass destruction before; we are determined to deny you the capacity to use them again." The UNS-COM team faced resistance from Iraq, which blocked inspections and hid deadly germ agents and warheads. Clinton then threatened military action several times when Hussein, who turned out to be Iraq's President, tried stalling the UNS-COM inspections. To weaken Hussein's grip of power, Clinton signed the Iraq Liberation Act into law on October 31, 1998, which instituted a policy of "regime change" against Iraq, though it explicitly stated it did not speak to the use of American military forces. Between December 16 and 19, 1998, Clinton ordered four-day period of concentrated air attacks against military installations in Iraq. This was in response to Saddam's refusal to cooperate with UN inspectors. After the bombing, Hussein blocked any further UN inspections and announced its attempt to shoot down Coalition aircraft in the no-fly zones over Iraq. For several years afterward, U.S. and Coalition aircraft routinely attacked hostile Iraqi defense installations in Iraq, in response to what the Clinton administration claimed were "provocations" by the Iraqi military, including antiaircraft fire and radar locks on U.S. and Coalition aircraft. The UN sanctions against Iraq that the United Nations Security Council imposed after the Gulf War remained in place during the Clinton administration. These sanctions were alleged to have contributed to increased child mortality there, although this was disputed. Albright later wrote "Saddam Hussein could have prevented any child from suffering simply by meeting his obligations. Recent research has shown that commonly cited data were fabricated by the Iraqi government and that "there was no major rise in child mortality in Iraq after 1990 and during the period of the sanctions." President Clinton's foreign policy team initially viewed Iran with suspicion and sought to contain Iranian ambitions as part of the dual containment strategy. On May 6, 1995, Clinton signed Executive Order 12957, which implemented tight oil and trade sanctions on Iran and made it illegal for American corporations or their foreign subsidiaries to participate in any contract "for the financing of the development of petroleum resources located in Iran." On May 6, 1995, President Clinton issued Executive Order 12959, which banned almost all trade between U.S. businesses and the Iranian government with the exception of informational materials. A year before, the President declared that Iran was a "state sponsor of terrorism" and a "rogue state," marking the first time that an American President used that term. In 1996, the Clinton administration agreed to compensate the Iranian government for the deaths of 254 Iranians in a 1988 incident in which an Iranian commercial passenger plane was shot down by USS Vincennes. In Clinton's second term as President, beginning in 1997, the administration began to take a softer approach towards Iran, particularly after the election of reformist Mohammad Khatami as President of Iran. That year, Secretary of State Madeleine Albright and President Clinton mandated what could be considered an apology to the Iranian people for the 1953 CIA-assisted coup that overthrew the democratically elected Prime Minister, Mohammed Mossadegh, and replaced him with the Shah, thus leading to the 1979 Islamic Revolution two decades later. Albright and Clinton also acknowledged that the U.S.-backed government of the Shah "oppressed political opponents." In the months that followed, an Iranian professional wrestling team was allowed entry into the U.S. to face American pros, and a significant increase in cultural and academic overtures were made between the two countries. In fact, in 1998, Iran and the United States faced each other in a game at the FIFA World Cup that year (Iran beat the US by 2–1). Khatami also encouraged Americans to travel to Iran for vacational purposes, citing the city of Esfahan, a popular location for tourists where, according to CNN, several "well-preserved" sites often "surprise" tourists. In a well-publicized 1997 interview, Khatami refused to fully apologize for the '79 hostage crisis in which 52 American diplomats were held hostage for 444 days yet did offer to open up a dialogue with the American people. Clinton at one point offered to open up an official dialogue with the Iranian government and renew diplomatic relations with the country after 20 years of no such relations. However, Ayatollah Ali Khamenei refused to accept the offer for dialogue unless the U.S. formally withdrew its support for Israel, lifted the '95 sanctions imposed on the country, stopped accusing Tehran of attempting to develop nuclear weaponry, and officially ended its policy of considering Iran a "rogue state that sponsors terrorism." Although Clinton did privately weigh the idea of revoking the executive orders he signed in the spring of 1995, the administration refused to comply with Iran's other demands. Eventually, President Clinton did ease restrictions on export of food and medical equipment to Iran. Albright announced in 2000 that the U.S. would begin to "enable Americans to purchase and import carpets and food products such as dried fruits, nuts, and caviar from Iran" and also was confident that Iran would provide cooperation with the United States in the battle against narcotics and international drug abuse. In 1995, the State Department warned U.S. citizens against traveling in Iran due to that government's rampant anti-Americanism yet five years later Albright decided to repeal this warning. By the time Clinton left office in January 2001, it was clear that relations between Iran and the United States had significantly cooled despite the fact that President Khatami and President Clinton failed to initiate an official diplomatic dialogue between the nations, something which has not existed since the 1979 hostage crisis. North Korea's feared aim to create nuclear weapons and ballistic missiles was a serious problem for the Clinton Administration. In 1994, North Korea, a signatory of the Nuclear Nonproliferation Treaty, refused to allow international inspectors to review two nuclear waste sites. The inspectors wanted to see if North Korea was in violation of the treaty since they were suspected of reprocessing spent fuel into plutonium, which could be used to manufacture nuclear weapons. Despite diplomatic pressure and repeated warnings by Clinton, North Korea refused to allow the inspections and even raised the prospect of war with South Korea, an ally of the United States. In 1994, Clinton also considered a US military strike on bombing the Yongbyon nuclear reactor. He was advised that if war broke out, it could cost 52,000 US and 490,000 South Korean military casualties in the first three months, as well as a large number of civilian casualties. Vice Marshal Jo Myong-rok meets Bill Clinton at the White House, October 2000. With private diplomacy by former president Jimmy Carter, the Clinton administration reached a breakthrough with North Korea in October 1994 when North Korea agreed to shut down the nuclear plants that could produce materials for weapons if the United States would help North Korea build plants that generated electricity with light-water nuclear reactors. These reactors would be more efficient and their waste could not easily be used for nuclear weaponry. The United States also agreed to supply fuel oil for electricity until the new plants were built, and North Korea agreed to allow inspection of the old waste sites when construction began on the new plants. KEDO was established based on this agreement in 1995. This 1994 Agreed Framework, as it was known, kept the Yongbyon plutonium enrichment plant closed and under international inspection until 2002. However, economic supports by the agreement and KEDO gave an advantage to North Korea, and North Korea broke off from the treaty and restarted plutonium production. In October 2006, North Korea tested its first nuclear weapon. President Bush warned that he was not pleased by such actions as it is he invited the international community to take a stand. As a result, North Korea, the United States, Russia, China were involved in negotiations and North Korea agreed to close down their nuclear station temporarily. Clinton faced yet another foreign crisis in early 1995, when the value of the Mexican peso began to fall sharply and threatened the collapse of the Mexican economy. Clinton believed the collapse of Mexico's economy would have a negative impact on the United States because of their close economic ties. He proposed a plan to address the financial crisis in Mexico, but many in Congress, fearing that constituents would not favor aid money to Mexico, rejected the plan. In response, Clinton drafted a $20 billion loan package for Mexico to restore international confidence in the Mexican economy. The loan was approved and Mexico completed its loan payments to the United States in January 1997, three years ahead of schedule. However, issues such as drug smuggling and U.S. immigration policies continued to strain relations between the United States and Mexico during Clinton's terms in office. After negotiations with representatives of the Cuban government, Clinton revealed in May 1995 a controversial policy reversing the decades-old policy of automatically granting asylum to Cuban refugees. Approximately 20,000 Cuban refugees detained at Guantanamo Bay Naval Base in Cuba were to be admitted to the United States over a period of three months. In order to prevent a mass exodus of refugees to the United States, all future refugees would be returned to Cuba. The influx of refugees into Guantanamo Bay overwhelmed the facilities, necessitating Operations Safe Haven and Safe Passage involving Panama. Clinton also implemented the wet foot/dry foot policy for Cuban refugees. This policy meant that Cuban refugees caught at sea were returned to Cuba (wet foot), while Cuban refugees that made it to dry land (dry foot) were allowed to stay in the U.S. This changed the refugees' tactics from slow rafts to speed boats. Relations between the United States and Cuba deteriorated in February 1996 when Cuba shot down two American civilian planes. Cuba accused the planes of violating Cuban airspace. Clinton tightened sanctions against Cuba and suspended charter flights from the United States to Cuba, hoping this would cripple Cuba's tourism industry. In their response to the incident, the U.S. Congress passed the Helms–Burton Act in March 1996. The bill strengthened an embargo against imports of Cuban products. Title III, however, made the bill controversial because it allowed American citizens whose property was seized during and after the 1959 Cuban Revolution to sue in American courts foreign companies that later invested in those properties. Title III sparked an immediate uproar from countries such as Mexico, Canada, and members of the European Union because they believed that they would be penalized for doing business with Cuba. In response, Clinton repeatedly suspended Title III of the legislation (the act gave the president the right to exercise this option every six months). Clinton softened his Cuban policy in 1998 and 1999. In March 1998, at the urging of Pope John Paul II, Clinton lifted restrictions and allowed humanitarian charter flights to resume. He also took steps to increase educational, religious, and humanitarian contacts in Cuba. The U.S. government decided to allow Cuban citizens to receive more money from American friends and family members and to buy more American food and medicine. Clinton also sought to end the conflict in Northern Ireland by arranging a peace agreement between the nationalist and unionist factions. In 1998 former Senator George Mitchell—whom Clinton had appointed to assist in peace talks—supported an accord that became known as the Good Friday Agreement. It called for the British Parliament to devolve legislative and executive authority of the province to a new Northern Ireland Assembly, whose Executive would include members of both communities. Years of stalemate have followed the agreement, mainly due to the refusal of the Provisional Irish Republican Army (IRA), a nationalist paramilitary group, to decommission its weapons for some years[quantify] and after that the refusal of the Democratic Unionist Party to push the process forward. Mitchell returned to the region and arranged yet another blueprint for a further peace settlement that resulted in a December 1999 formation of the power-sharing government agreed the previous year, which was to be followed by steps toward the IRA's disarmament. That agreement eventually faltered as well, although Clinton continued peace talks to prevent the peace process from collapsing completely. In 2005 the IRA decommissioned all of its arms and, in 2007, Sinn Féin expressed a willingness to support the reformed Police Service of Northern Ireland (PSNI). Power was restored to the Assembly in May 2007, marking renewed promise for the fulfillment of the Good Friday Agreement. In 1994, the Clinton administration announced that it was lifting the trade embargo on Vietnam, citing progress on the Vietnam War POW/MIA issue regarding the search for American soldiers listed as missing in action and the remains of those killed in action, as well as the market reforms that Vietnam implemented from 1986. On July 10, 1995, Clinton announced that his administration was restoring full diplomatic relations with Vietnam, citing the continued progress in determining the whereabouts of MIA's and locating the remains of soldiers killed in the Vietnam War. Clinton nonetheless stressed that the search for Americans would continue, especially for the soldiers listed as "discrepancies;" namely 55 American soldiers believed to still be alive when they went missing. On November 16, 2000, Clinton arrived in Hanoi with his wife, Senator-elect Hillary Clinton and daughter Chelsea shortly before his second term in office ended. The next day Clinton spoke to the Vietnamese people publicly about both the conflict as well as the promise renewed relations meant. 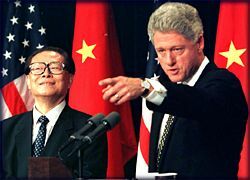 Jiang Zemin and Bill Clinton. In 1995, tense relations with China and the imprisonment of an innocent American in the Communist nation, led to pressure for the U.S. to boycott the 1995 United Nations Fourth World Conference on Women in Beijing. The U.S. delegation, chaired by First Lady Hillary Rodham Clinton and Madeleine Albright, then the United States Ambassador to the United Nations, was assigned with the task of confronting China about its human rights abuses, but not so strongly as to damage sensitive relations. Hillary Rodham Clinton gave a successful speech before the entire Chinese leadership and the Conference where she, without bringing up China or any particular nation, attacked human rights abuses against humanity in general, and women and girls in particular. In 1995-96 the Third Taiwan Strait Crisis happened between Taiwan and China. Chinese concerns about the upcoming Taiwanese presidential election as well as the possibility of the declaration of Taiwanese independence led to a series of missile tests right off the coast of Taiwan that could have escalated out of control. The Clinton administration responded in March 1996 by staging the biggest display of American military might in Asia since the Vietnam War. Numerous aircraft carrier groups were stationed near Taiwan. USS Nimitz and her group as well as USS Belleau Wood sailed through the Taiwan Strait in a demonstration of support for Taiwan. Eventually a ceasefire was declared and China declared the 'missile tests' to be completed. From June 25 to July 3, 1998, Clinton visited the People's Republic of China with Hillary Clinton and their daughter for 9 days. This visit duration was exceptional as the national leader. In addition, because the doubt of the political donations from China disputed in 1997 was known worldwide, the nations and regions surrounding China, particularly Taiwan and Japan were disappointed awfully. In 1999 Clinton signed a landmark trade agreement with the People's Republic of China. The agreement–the result of more than a decade of negotiations–would lower many trade barriers between the two countries, making it easier to export U.S. products such as automobiles, banking services, and motion pictures. The Chinese citizens ability to afford and purchase U.S. goods should have been taken into consideration. However, the agreement could only take effect if China was accepted into the WTO and was granted permanent "normal trade relations" status by the U.S. Congress. Under the pact, the United States would support China's membership in the WTO. Many Democrats as well as Republicans were reluctant to grant permanent status to China because they were concerned about human rights in the country and the impact of Chinese imports on U.S. industries and jobs. Congress, however, voted in 2000 to grant permanent normal trade relations with China. On February 26, 1993, thirty-six days after Clinton took office, terrorists who the CIA would later reveal were working under the direction of Osama bin Laden detonated a timed car bomb in the parking garage below Tower One of the World Trade Center in New York City (see the World Trade Center bombing). Clinton responded by ordering his National Security Council, under the direction of Anthony Lake, and the FBI to find and punish those responsible. The FBI was able to quickly identify the vehicle used in the bomb from a remnant found in the rubble: a Ryder rental van, which had been reported stolen in Jersey City, New Jersey the day before. The truck was rented by Mohammed Salameh, whom the FBI immediately detained. Similar evidence led to the arrests of other plotters behind the attack, including Nidal Ayyad, Mahmoud Abouhalima, Ahmad Ajaj, and Ramzi Yousef—who was identified as the key player in the bombing. All men were tried and convicted for the bombing and other terrorists activities. In his 1995 State of the Union address, Clinton proposed "comprehensive legislation to strengthen our hand in combating terrorists, whether they strike at home or abroad." He sent legislation to Congress to extend federal criminal jurisdiction, make it easier to deport terrorists, and act against terrorist fund-raising. Following the bombing of the Alfred P. Murrah Federal Building in Oklahoma City, Clinton amended that legislation to increase wiretap and electronic surveillance authority for the FBI, require explosives to be equipped with traceable taggants, and appropriate more funds to the FBI, CIA, and local police. In June 1995, Clinton issued Presidential Decision Directive 39, which stated that the United States "should deter, defeat and respond vigorously to all terrorist attacks on our territory and against our citizens." Furthermore, it called terrorism both a "matter of national security" and a crime. The implementation of his proposals led to a substantial increase in counter-terrorism funds for the FBI and CIA. In 1996, the CIA established a special unit of officers to analyze intelligence received about bin Laden and plan operations against him, coined the "Bin Laden Issue Station". It was this unit that first realized bin Laden was more than just a terrorist financier, but a leader of a global network with operations based in Afghanistan. Given these findings, the NSC encouraged the Department of State to "pay more attention" to Afghanistan and its governing unit, the Taliban, which had received funding from bin Laden. The State Department requested the Taliban to expel bin Laden from the country, noting that he was a sponsor of terrorism and publicly urged Muslims to kill Americans. The Taliban responded that they did not know his whereabouts and, even if they did, he was "not a threat to the United States." The CIA's counter-terrorism division quickly began drafting plans to capture and remove bin Laden from the country. However, Marine General Anthony Zinni and some[who?] in the State Department protested the move, saying that the United States should focus instead on ending the Afghan civil war and the Taliban's human rights abuses. In 1998, Clinton appointed Richard Clarke—who until then served in a drugs and counter-terrorism division of the CIA—to lead an interagency comprehensive counter-terrorism operation, the Counter-terrorism Security Group (CSG). The goal of the CSG was to "detect, deter, and defend against" terrorist attacks. Additionally, Clinton appointed Clarke to sit on the cabinet-level Principals Committee when it met on terrorism issues. Clinton's Counter-terrorism Center began drafting a plan to ambush bin Laden's compound in Kandahar. The CIA mapped the compound and identified the houses of bin Laden's wives and the location where he most likely slept. The plan was relatively simple, at least on paper. Tribals would "subdue" the guards, enter the compound, take bin Laden to a desert outside Kandahar, and hand him over to another group of tribals. This second group would carry him to a desert landing strip—which had already been tested—where a CIA plane would take him to New York for arraignment. When they completed a draft plan, they ran through two rehearsals in the United States. Confident that the plan would work, the Counter-terrorism Center of the CIA sought the approval of the White House. While they acknowledged that the plan was risky, they stated that there was "a risk in not acting" because "sooner or later, bin Laden will attack U.S. interests, perhaps using WMD." Clarke reviewed the plans for Sandy Berger, the National Security Director, and told him that it was in the "very early stages of development" and stressed the importance of only targeting bin Laden, not the entire compound. The NSC told the CIA to begin preparing the necessary legal documents to execute the raid. The senior management of the CIA was skeptical of the plan, and despite objections, canceled the operation, fearing that the risk to their operatives and financial costs were too high. It is unclear whether or not Clinton was aware of the plan. As the Counter-terrorism Center continued to track bin Laden, they learned in 1998 that the Saudi government had bin Laden cells within the country that were planning attacks on U.S. forces. CIA Director George Tenet, encouraged by the Saudi's show of force against bin Laden, asked them to assist in the fight against bin Laden. Clinton named Tenet as his informal "personal representative" to work with Saudi Arabia on terrorism. The Saudis promised Tenet that they would do everything they could to convince the Taliban to release bin Laden for trial in America or elsewhere. The Saudi intelligence chief, Prince Turki bin Faisal, held various meetings with Taliban chief Mullah Omar and other leaders and received assurance that bin Laden would be removed. Omar, however, reneged on that promise. On August 7, 1998, Bin Laden struck again, this time with simultaneous bombings on the U.S. embassies in Nairobi, Kenya, and Dar es Salaam, Tanzania. (see above) The CIA, having confirmed bin Laden was behind the attack, informed Clinton that terrorist leaders were planning to meet at a camp near Khowst, to plan future attacks. According to Tenet, "several hundred," including bin Laden, would attend. On August 20, Clinton ordered cruise missile strikes on Al-Qaeda terrorist training camps in Afghanistan and a pharmaceutical factory in Khartoum, Sudan, where bin Laden was suspected of manufacturing biological weapons. While the military hit their targets, bin Laden was not killed. The CIA estimated that they had missed bin Laden by "a few hours." At the time of the attacks, Clinton was embroiled in the Lewinsky scandal (see below). This led many Republicans in Congress to accuse the president of "wagging the dog"—launching a military attack simply to distract the public from his personal problems. Clinton and his principals, however, insist that the decision was made solely on the basis of national security. After the attacks failed, Clinton moved his focus to diplomatic pressure. On the advice of the State Department, Clinton encouraged Pakistan, whose military intelligence agency was a patron of the Taliban, to pressure the Taliban to remove bin Laden. After numerous meetings with Pakistani Prime Minister Nawaz Sharif, the Pakistani's would still not cooperate. Sharif eventually agreed to allow the United States to train Pakistani special forces to find bin Laden. When Sharif was ousted by Pervez Musharraf, the plan was abandoned. After encouragement by Richard Clarke, Clinton issued an executive order in July 1999 declaring the Taliban regime as a state sponsor of terrorism. This was followed in October 1999 by Resolution 1267 sponsored by the United States placing economic and travel sanctions on the Taliban. The Taliban, however, stood by bin Laden, and the United States, along with Russia, proposed yet another UN resolution (Resolution 1333), this time imposing an embargo an arms shipments to the Taliban. The move was meant to weaken the Taliban in their fight against the Northern Alliance in their civil strife. However, the resolution did little to limit the illegal flow of arms from Pakistan. In August 1999, Clinton signed a Memorandum of Notification ordering the CIA to develop another plan to capture bin Laden, and giving the CIA the authority to order bin Laden be killed. Near the end of 1999, the Clinton administration, working with the government of Jordan, detected and thwarted a planned terrorist attack to detonate bombs at various New Year millennium celebrations around the world. The CIA confirmed that bin Laden was behind the plot, which was disrupted just days before the New Year. While many credited Clinton's new CSG for playing a role in the foiling of these plots, critics claim it was "mostly luck." The CIA informed Clinton that they feared the thwarted attacks were just part of a larger series of attacks planned for the new year. Clinton asked Clarke and the CSG to draft plans to "deter and disrupt" al Qaeda attacks. On October 12, 2000, terrorists bombed USS Cole in the harbor of the Yemeni port of Aden. The attack on USS Cole, a U.S. Navy destroyer, killed 17 Navy sailors, and there was no clear indication during the last months of Clinton's term of who was responsible. The CIA reported that they had "no definitive answer on [the] crucial question of outside direction of the attack—how and by whom. Clinton did not think it would be wise to launch an attack based on a "preliminary judgment," stating that he would have taken further action had he received definitive intelligence. The CIA was eventually able to confirm bin Laden's involvement with certainty a week after the Bush administration took office. As Clinton's second term drew to a close, the CSG drafted a comprehensive policy paper entitled "Strategy for Eliminating the Threat from the Jihadist Networks of al Qida: Status and Prospects." The paper outlined a method to "roll back" al Qaeda over "a period of three to five years." Clarke stated that while "continued anti-al Qida operations at the current level will prevent some attacks, [it] will not seriously attrit their ability to plan and conduct attacks." This policy paper was forwarded to the incoming Bush administration. Sudan's minister of defense, Fatih Erwa, has claimed that Sudan offered to hand Bin Ladin over to the United States. The Commission has found no credible evidence that this was so. Ambassador Carney had instructions only to push the Sudanese to expel Bin Ladin. Ambassador Carney had no legal basis to ask for more from the Sudanese since, at the time, there was no indictment outstanding. Clinton acknowledged that, following the bombing on USS Cole, his administration prepared battle plans to execute a military operation in Afghanistan to overthrow the Taliban and search for bin Laden. The plans were never implemented because, according to Clinton, the CIA and FBI refused to certify that bin Laden was responsible for the bombing until after he left office and the military was unable to receive basing rights in Uzbekistan. In relation to Afghanistan, Clinton criticized the Bush Administration when he said "We do have a government that thinks Afghanistan is one-seventh as important as Iraq". Clinton also said that his administration left the plans and a comprehensive anti-terror strategy with the new Bush Administration in January 2001. In 2014, a September 10, 2001, audio containing Clinton's conservation at a business center at Melbourne, Australia, 10 hours before the 9/11 attacks regarding the topic of terrorism was revealed. In this audio, Clinton stated that according to intelligence agencies, Bin Laden was located in Kandahar, Afghanistan, in December 1998, and thus, a missile strike was proposed. However, he decided not to kill Bin Laden because of conflicting reports of intelligence information to his true whereabouts as well as the potential risk for civilian casualties. He stated that, "I'm just saying, you know, if I were Osama bin Laden—he's a very smart guy, I've spent a lot of time thinking about him—and I nearly got him once." And then he said that, "I nearly got him. And I could have killed him, but I would have to destroy a little town called Kandahar in Afghanistan and kill 300 innocent women and children, and then I would have been no better than him. And so I didn't do it." In 1996 Clinton signed the United States onto the Comprehensive Test Ban Treaty (CTBT), a landmark international agreement that prohibited all signatory nations from testing nuclear weapons. The following year, he sent the treaty to the Senate for ratification and they rejected it in October 1999. International reaction to the Senate's action was uniformly negative, and the rejection was a political setback for Clinton, who had lobbied actively for its approval. Despite the rejection of the treaty, Clinton promised that the United States would continue to maintain a policy of not testing nuclear weapons, which had been in place since 1992. Throughout the 1990s, the Congress refused to appropriate funds for the United States to pay its dues to the United Nations. By 1999 the United States owed the UN at least $1 billion in back dues. That same year Clinton reached a compromise with Republicans in Congress to submit more than $800 million in back dues. Republicans in the House of Representatives had insisted that UN debt repayments be accompanied by restrictions on U.S. funding for international groups that lobbied for abortion rights in foreign countries. Clinton had vetoed similar measures in the past, but he agreed to the restrictions when faced with the prospect that the United States would lose its vote in the UN General Assembly for nonpayment of dues. Public opinion in the United States about the role the country should have in the Bosnian genocide was relatively stable. A series of Gallup polls through 1995-1997 showed that public disapproval of military intervention in Bosnia hovered around 52%, with the only outlier occurring in January 1997, where 58% of the population disapproved. The polls also found that public opposition was overall bipartisan, with 49% of Republicans and around 40% of Democrats and Independents disapproving. Americans were less supportive of the US involvement in Kosovo. A Gallup poll in March 1999 showed that about half of the American public supported NATO air strikes in Yugoslavia. Despite this, the article notes that public support for military intervention in Yugoslavia was the lowest in any armed combat mission in the past decade. More research done by the Pew Research Center demonstrated how fewer people were following the news about US involvement in Kosovo, falling from 43% to 32% in the period of two months. The public opinion to the Clinton administration's decision to not intervene in Rwanda during its genocide was not measured as prominently. However, multiple outlets have retroactively blamed this on the fact that the crisis was not being fairly covered. There have been recent claims that the news media and Clinton administration deliberately lessened coverage of the Rwandan crisis in order to soften the impact of the US decision to not get involved. However, others state that the reason why the United States did not enter Rwanda is because of the public reluctance to enter combat after the Vietnam War. ^ "Overview of the US intervention in Somalia". Military.com. Retrieved 2009-09-24. ^ Rory Carroll (March 31, 2004). "US Chose to Ignore Genocide". The Guardian. London. Retrieved 2009-09-24. ^ "BBC News, 1 April 2004". BBC News. December 18, 2008. Retrieved 2009-09-24. ^ Remnick, David (September 18, 2006). "The Wanderer". The New Yorker. Retrieved 2013-08-08. ^ Only realism can help Africa, Magazine for Development and Cooperation [editorial]. D+C 2003:10. ^ "U.S. missiles pound targets in Afghanistan, Sudan". CNN. Retrieved 2009-09-24. ^ "U.S. missiles pound targets in Afghanistan, Sudan". CNN. August 20, 1998. Retrieved 2009-09-24. ^ Patrick Gavigan (October 1, 1997). "Migration emergencies and human rights in Haiti". Organization of American States. Archived from the original on November 1, 2012. Retrieved November 1, 2012. The surprise coup in September 1991 opened the refugee floodgates. Within six months of the coup the US Coast Guard had intercepted more than 38,000 Haitians at sea; 10,747 were eventually allowed to pursue asylum claims in the US following screening by immigration officials on board ships or at the US naval base at Guantánamo Bay. An estimated 10% of the population of Port-au-Prince and Haiti's other large cities fled into the mountains, generating an internally displaced population of perhaps 300,000. A further 30,000 crossed into the Dominican Republic. ^ "A History of the Israel-Palestine Conflict". Pbs.org. December 13, 2001. Retrieved 2009-09-24. ^ "Israeli Elections 1999 – Character, Political Culture, and Centrism". Jcpa.org. Retrieved 2009-09-24. ^ "The Right Ear", in Human Events, July 16, 2001, Vol. 57, Issue 26. ^ John Pike. "Air Strike 13 January 1993 – Operation Southern Watch". Globalsecurity.org. Retrieved 2009-09-24. ^ "The Use of Force in International Law". Courts.fsnet.co.uk. Archived from the original on June 19, 2008. Retrieved 2009-09-24. ^ Bill Clinton (January 27, 1998). "Text of President Clinton's 1998 State of the Union Address". The Washington Post (Press release). Retrieved August 30, 2011. ^ "Iraq surveys show 'humanitarian emergency'". Newsline. Unicef.org. August 12, 1999. Retrieved 2013-02-25. ^ "The Politics of Dead Children: Have sanctions against Iraq murdered millions?". Reason. Retrieved 2009-09-24. ^ Rubin, Michael (December 2001). "Sanctions on Iraq: A Valid Anti-American Grievance?". 5 (4). Middle East Review of International Affairs: 100–115. Archived from the original on October 28, 2012. ^ Albright, Madeleine (2003). Madam Secretary: A Memoir. p. 275. Retrieved 2013-02-25. ^ Dyson, Tim; Cetorelli, Valeria (2017-07-01). "Changing views on child mortality and economic sanctions in Iraq: a history of lies, damned lies and statistics". BMJ Global Health. 2 (2): e000311. doi:10.1136/bmjgh-2017-000311. ISSN 2059-7908. ^ "Saddam Hussein said sanctions killed 500,000 children. That was 'a spectacular lie.'". Washington Post. Retrieved 2017-08-04. ^ "Context of 'May 6, 1995: US Prohibits American Business Firms from Trading with Iran'". Cooperativeresearch.org. Retrieved 2009-09-24. ^ Larry A. Niksch (March 17, 2003). North Korea's Nuclear Weapons Program (PDF) (Report). Congressional Research Service. IB91141. Retrieved 2009-09-24. ^ Jager, Sheila Miyoshi (2013). Brothers at War – The Unending Conflict in Korea. London: Profile Books. p. 439. ISBN 978-1-84668-067-0. ^ Oberdorfer, Don; Carlin, Robert (2014). The Two Koreas: A Contemporary History. Basic Books. p. 247. ISBN 9780465031238. ^ kEDO. About Us: Our History. The Korean Peninsula Energy Development Organization. ^ John King and Kelly Wallace, The Associated Press and Reuters (November 17, 2000). "Tumultuous crowd welcomes Clinton to Hanoi". CNN. Archived from the original on March 20, 2005. Retrieved 2006-10-23. ^ Sino-U.S. relations: facts & figures. US President Bill Clinton Visits China. China Internet Information Center. ^ a b c d e f g h National Commission on Terrorist Attacks. The 9/11 Commission Report. Washington: July 2004. ^ Presidential Decision Directive/NSC-39, "US Policy on Counter-terrorism," June 21, 1995. ^ a b c d e Clarke, Richard. Against All Enemies. September 2004. New York: The Free Press. ^ Coll, Steve. Ghost Wars. January 2005. New York: Penguin Group. ^ CIA Memo, to Tenet, "Information Paper on Usama bin Ladin," February 12, 1998. ^ National Security Council note, Simon to Berger. February 27, 1998. Declassified by 9/11 Commission. ^ Department of State memo, Sheehan to Albright, "S/CT Update on Critical Issues." July 9, 1999. ^ UN Security Council Resolution 1267, October 15, 1999. ^ UN Security Council Resolution 1333, December 19, 2000. ^ "Foiling millennium attack was mostly luck". MSNBC. April 29, 2004. Retrieved 2009-09-24. ^ a b "Transcript: William Jefferson Clinton on 'FOX News Sunday'". Fox News Channel. September 26, 2006. ^ "Transcript: William Jefferson Clinton on 'FOX News Sunday'". Archived from the original on March 15, 2008. ^ "9/11 Commission Report, Chapter 4" (PDF). 9/11 Commission. p. 110. Retrieved 2007-07-25. ^ a b "Bill Clinton: I got closer to killing bin Laden". CNN. September 24, 2006. ^ "Online News Hour – Paying U.N. Dues". Pbs.org. Retrieved 2009-09-24. ^ Inc., Gallup,. "Americans Divided On U.S. Troops In Bosnia". Gallup.com. Retrieved 2017-11-03. ^ Inc., Gallup,. "Public Support for U.S. Involvement in Yugoslavia Lower Than for Gulf War, Other Foreign Engagements". Gallup.com. Retrieved 2017-11-03. ^ "Washingtonpost.com: What Americans Think". ISSN 0190-8286. Retrieved 2017-11-03. ^ Board, The Editorial (2014-04-08). "Opinion | After Rwanda's Genocide". The New York Times. ISSN 0362-4331. Retrieved 2017-11-03. ^ Carroll, Rory (2004-03-31). "US chose to ignore Rwandan genocide". The Guardian. ISSN 0261-3077. Retrieved 2017-11-03. ^ Jentleson, Bruce (August 1998). "Still Pretty Prudent: Post-Cold War American Public Opinion on the Use of Military Force". Journal of Conflict Resolution. 42: 4. doi:10.1177/0022002798042004001.